The sun filters through the pines onto the Best Little Trailer. The crew and I have had our breakfast and the night chill is gone. It’s time to take a stroll through the campground! Reggie waits patiently while I lift Bridget into her car. 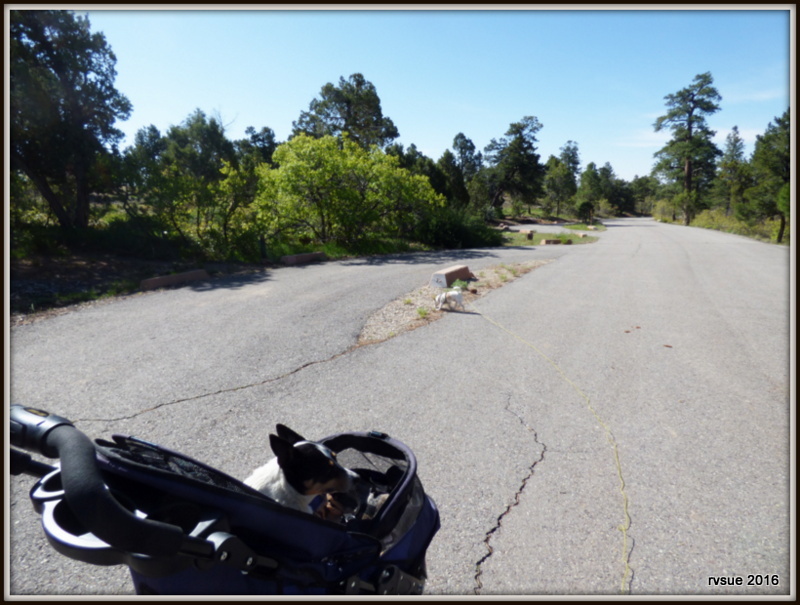 Part of the fun this first day at a new campground is investigating empty campsites. This campsite (next photo) is the one nearest to us. Someone has reserved it for Memorial Day weekend. 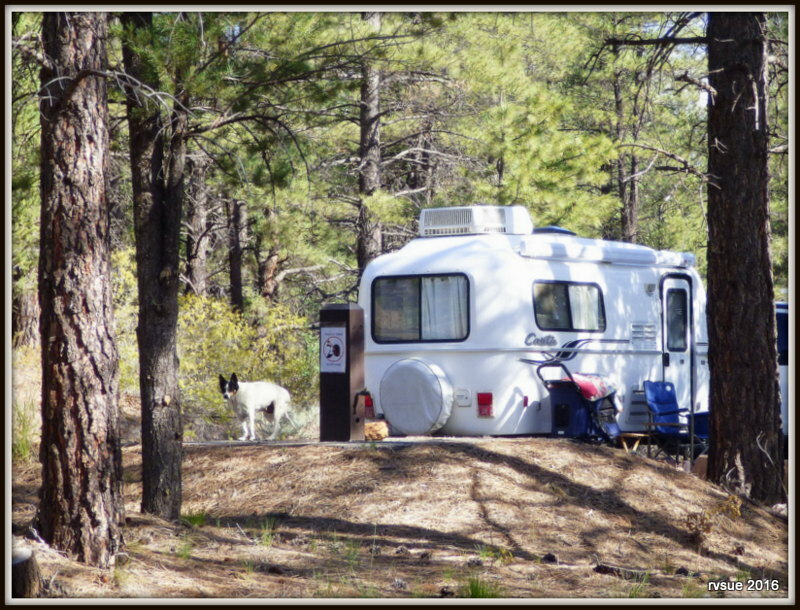 Devil’s Canyon Campground has some big, pull-through sites. The photo above makes those sites seem plain and unattractive. Not so. Each one has a charming area for sitting outside around a campfire, grilling, and eating at a picnic table without a view of neighboring RVs. This is the picnic table of a pull-throught site. I park her car at the next campsite and let her out. It’s a beautiful morning. No wind. Quiet except for birds singing. I amuse myself by finding and photographing rock-with-flowers arrangements. 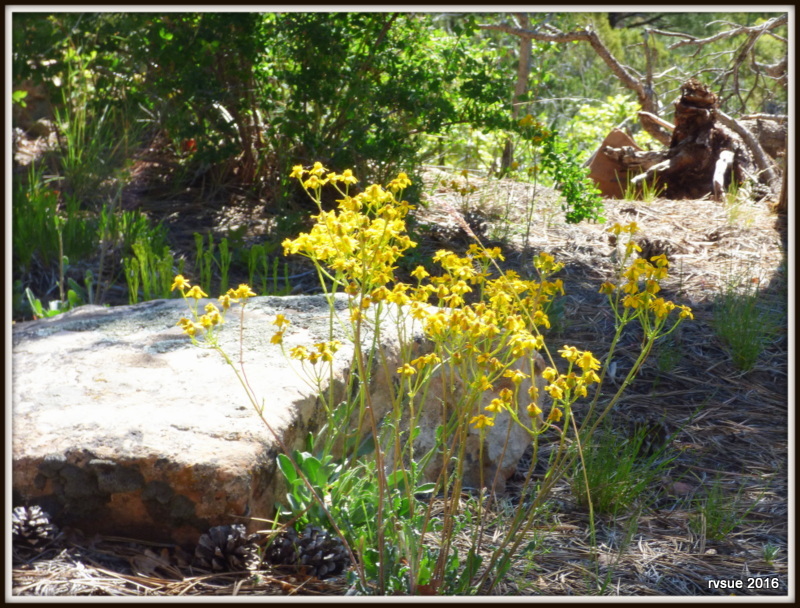 These yellow flowers are scattered around the campground. It looks like there are some at every campsite. They add a cheerful touch. Bridget turns around and leads the way. She’s feeling great this morning! We come to a campsite occupied by a little trailer. The name “Silver Shadow” is printed on the side. The next photo shows the width of the trailer, as well as the window for star gazing from one’s bed. You can see more photos of the Silver Shadow and also read the specs by following this link. Right before our camp, I notice two deer watching us from the shadows. Bridget waits to be let inside for a drink. Reggie checks that all his toys are still here. He’s tired. That walk wore him out. Bridget will be snoozing in no time at all . . . In the next post . 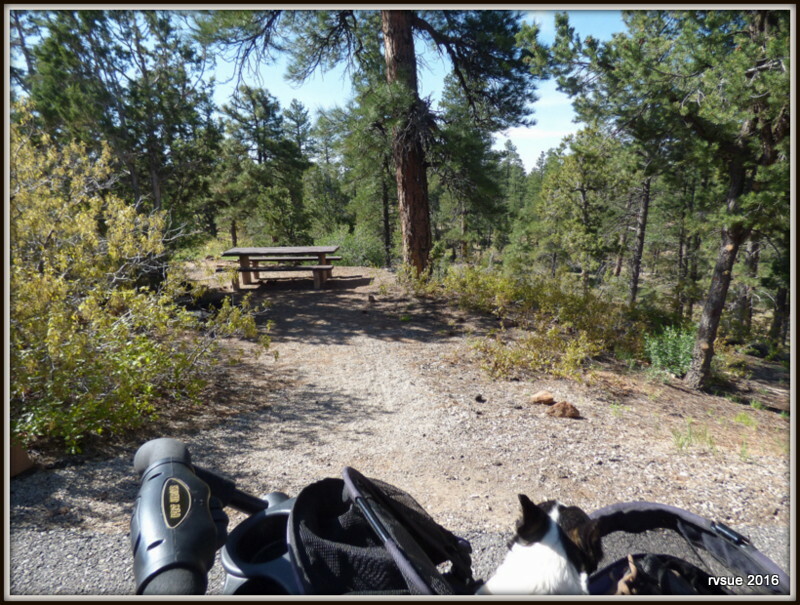 . .
A ride to check out two campgrounds in Manti LaSal National Forest! Using my new, big colander! CLICK LINK TO SHOP AMAZON NOW! 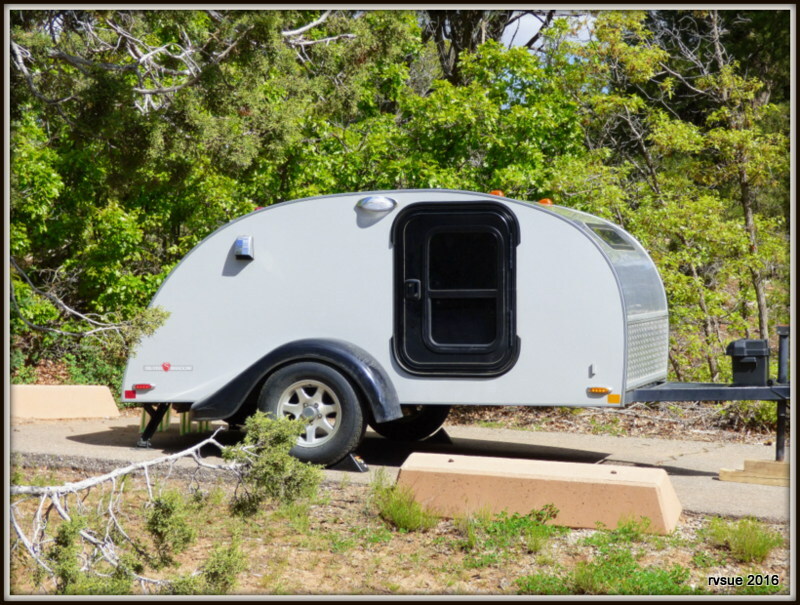 This entry was posted in Utah and tagged campground, Devil's Canyon, dogs, Manti LaSal, National Forest, RVing, Silver Shadow, teardrop, travel trailer. Bookmark the permalink. The Silver Shadow was my first love, and what got us eventually into T@Bs!!! AND I DIDN’T EVEN NOTICE!!! Okay, I lied. I did notice. But seriously, I was just squeeing about the Silver Shadow in the title. I love their galleys–or the older one’s galleys. I am not as fond of the newer galleys where the fridge/cooler thing is sideways and thus takes up lots of storage space. The older ones had really amazing storage. Readers not familiar with the Silver Shadow… Click on the link in the post to see what K-chick is talking about. I’m sure a lot of people prefer the larger fridge, though. And finally, the new 2017 model. If I’d bought an older one I’d probably be dying now, because I love this so much, and would want it instead [only of course, with the old galley, LOL]! I did tell you a am very crushy on Silver Shadows. And finally [gee, I can’t shut up this morning], I hope the cup holder you linked to was an order for two, because if it was, I ordered them! If it wasn’t, I’ll try to make sure I have the right link next time. I know how. I just sometimes dither so much before actually buying that the original link may no longer give you credit, and I need to watch that. Also, I’m thinking we may need to put dog beds out for our dogs, too. We’ve just been letting them lay on the rug or the ground, depending on where we are and where they’re tethered. I’m sure having their beds would make them more comfortable and also feel more at home. Seeing Reggie in his bed with his toy drove that home! Thanks for ordering Amazon through my blog’s links. I checked and yes, there are two cup holders. It’s nice of you to remember me and my crew before shopping. We move around so much that putting out the doggie beds seems to reassure Bridge and Reggie that “yes, this is home.” I think the beds are comforting in more ways than one. Reggie has a new game. 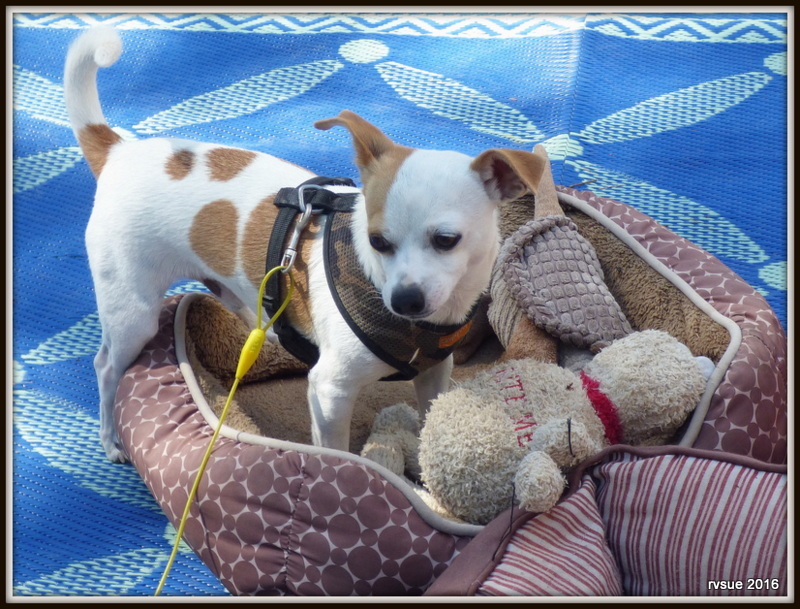 He takes a toy into a doggie bed. When I come near, he runs with the toy to the other bed. I chase him back and forth until my head spins. Nevertheless, I am THRILLED to have found you!!!! I am nearing 60 and am gearing up my plans to follow in your footsteps!! I, however, will be van-dwelling instead. I so look forward to utilizing all your knowledge & wisdom you have so kindly documented!! Thanks for all your time blogging for the world!! 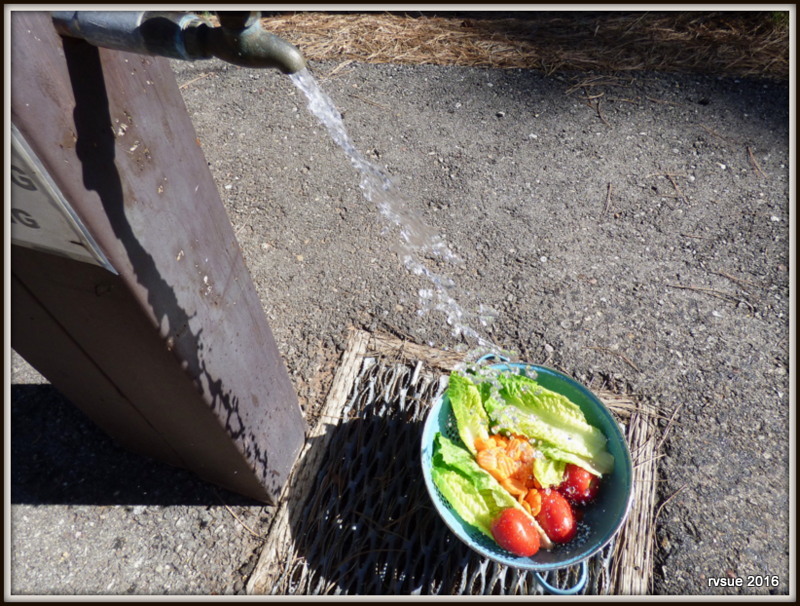 Welcome to RVSue’s Blog Lauri! I’m sure you’re aware of Bob’s site, cheaprvlinging. He has a large following of van-dwellers. That doesn’t mean you can’t follow my blog, too! I hope to hear more about your progress toward a life of vagabonding. Best wishes as you plan and prepare! As for initiating a comment… It’s hard for me to explain because I’m not sure how the comment box appears for readers. It may be different than what appears for me, as the administrator. Be sure to scroll to the end of comments. You may find it there. Blogorinos? Would someone describe how to find the place to start a comment please? Okay, I’ll describe the way it is on my laptop’s screen , other devices may vary. Scroll down the page to just beneath the last comment there. In bold type LEAVE A REPLY is seen, below that a place to enter what’s required-one’s name and e- mail address (which will not show on this page with your comment). Fill those in , type your comment in the box provided, click on “post comment”. It just occurred to me that since Lauri likely filled in the required fields in order to have replied, her information will already be appearing on her device’s screen. If so, there’s no need to reinsert that, just type the comment in then click on post comment. YES! TIED FOR SECOND PLACE! YAY, LINDA ROSE et al! YOU DID IT, DAWN! SECOND PLACE AND ONLY ONE MINUTE AWAY FROM FIRST! Sue and Crew, I might actually be in the top 10 today! And I always read every post first! That campground looks beautiful, esp. with the yellow flowers. I’m glad The Divine Miss B walked with you. Our ol’ gal, Dixie, is having a lot of trouble getting around and it breaks our hearts. Her tail is still wagging and her appetite fair. My husband carries her up the stairs to her ‘night-night’ bed and then carries her down in the morning. I’m afraid her time with is getting shorter and shorter. We all love our precious animals, don’t we?! Keep having fun and peace, Sue! You’re in third place today…. I share your feelings about Dixie. We’re going through something similar here. One day it seems like the end is near. Lie awake at night preparing oneself for the heartache. The next morning she’s skipping around, happy as can be! This is a special time, although heart-breaking, between you, your husband, and your Dixie gal. I know you savor the time that is left . . . as long as the tail keeps wagging, right? Good morning… I am so happy to see your post. Such a special way to kick off the holiday. Enjoy yours. Thanks, Marilyn, and good afternoon to you! Well, close to the top, anyway. Beautiful camp area! Google maps looks like there may be boondocking opportunities further up the road from the campground. I’m sure you will enjoy exploring the area. You sure caught that deer in flight! There may very well be boondocks nearby. To be honest, I’m not very interested in boondocking here, mainly because of the bear and cougar population. 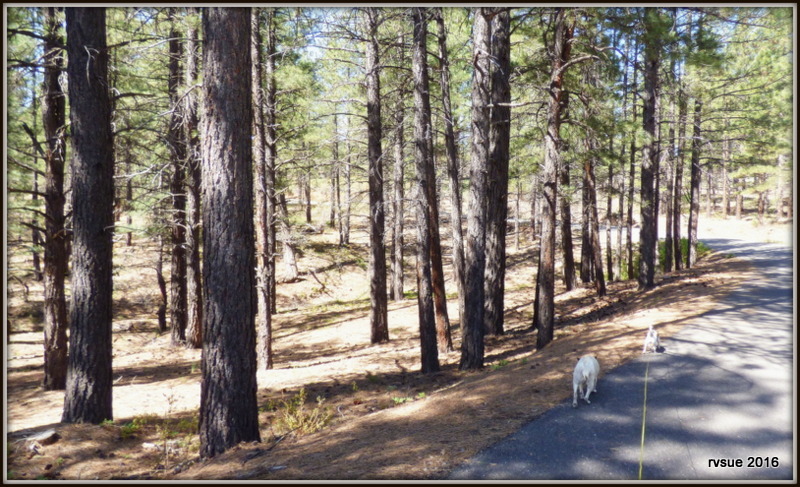 Other reasons for choosing the campground: Only $5 a day, smooth pavement for Bridget’s car, water spigot handy (right next to our site! ), trash bins, and camp hosts in case the crazies show up for the holiday weekend. Oh, yes, those are definitely good things to keep in mind when choosing! Thanks for pointing them out. It looks like a great campground anyway. I was just exploring the area on the map. I didn’t think about the wild life, human and otherwise! The devil meaning the little devil who pesters me to play all day? Ha! It is heartening to see Bridget trotting along. So far she’s been agreeable to walk as well as ride. I was afraid she’d love her car so much that she’d refuse to walk. 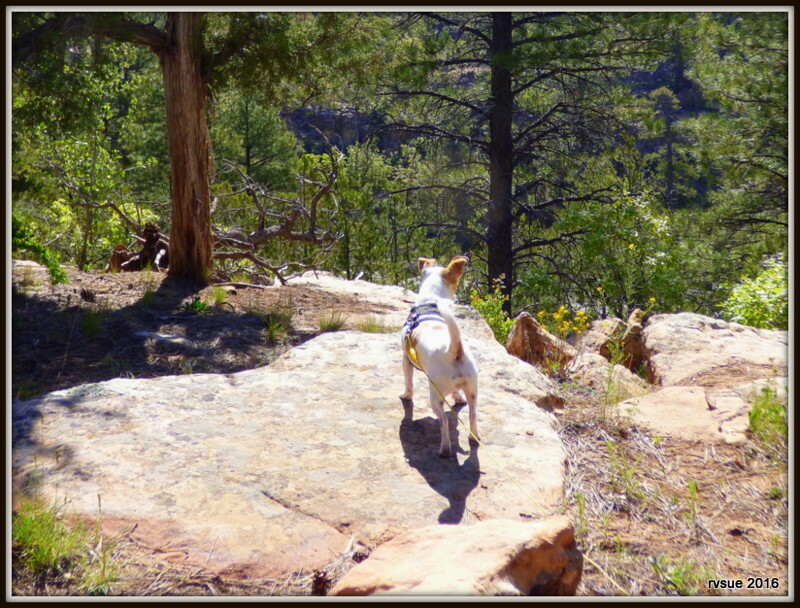 Usually I put her on the ground for the “home stretch.” She likes showing us the way back to camp. I hope you do have a sunny weekend, enough to make your holiday comfortable and fun to be outside. HA HA … good one, Cheryl. The weather rule in the Sound is: it MUST rain on every 3 day weekend. At least on that Monday. 🙁 Oh well. The weather doo-dad said it will go from 60’s daytime – 40’s nighttime to 80’s – 60′ ….. on TUESDAY. The price we pay for the beauty that abounds. Not so bad. But, a visit to the southwest (even via RVSue) could be just the ticket. I’m taking that sunny Tuesday off for a 4 day weekend. I used to live in Black Diamond when I was a toddler. I’ve been reading about the Oakpointe/Crown development in that area. I hope the ecosystem is well managed during the process. Yes I have a ticket in my future to explore the southwest due RVSue’s adventures. Looking forward to it asap. 3rd? i might be getting my mojo back! This looks like a great spot to hunker down thru the holiday weekend. Lookong at the veggies in your colander I couldn’t figure out what the orange is in the middle, sliced carrots? When you list some of the items people have purchased I always go to Amazon to check them out. Kind of fun. It’s going to be mid 90’s here this weekend. Glad you’re enjoying milder weather. Yes, those are carrots. I bought a bag already sliced but it didn’t say they were washed. Thanks for the feedback on the links to readers’ purchases. I’ll keep showing them. I think it’s fun, too. Hi, Rusty! You and Piper have a wonderful holiday weekend together! This looks like a great camp ground. I’m glad they don’t allow all the sites to be reserved. It was nice seeing Bridget feel up to walking today. Hope your neighbors for the long weekend are quiet. I agree with you, of course, about leaving several sites open for first-come, first serve. My heart sank when we first cruised through the other loop. I like our loop better. Often the reservation sites are the best. It’s nice (for us!) to see the opposite is true here. I’m optimistic we will have a quiet weekend. People tend to go off sightseeing from their camps here . . . . Wonderful hummingbird pics, Lisa. Love love. What a wonderful life you and the crew have! Are those carrots? Pretty fancy knife work! It is a wonderful life. Sometimes I can scarcely believe I’m living it. Enjoy your weekend, Cindy and Jules! Looks like another beautiful day. Glad Bridget had a good day. It keeps raining, snowing, sleeting here in Yellowstone. I am ready for warmer weather! Oh, darn! I’m sorry about that, Page. After being in heavy traffic on our San Diego freeways this morning, your pictures are so relaxing. Looking forward to a calm life like this with no freeways. No more driving until Tuesday morning, I am happy. Have a wonderful traffic free weekend! Great to hear you can relax this weekend. It sounds like you’ve earned a break. I don’t know how people cope with the traffic. One car drives up behind me and I pull over to let them by because I don’t want to be in traffic. I imagine what you deal with is much more challenging than that! I’m glad my blog’s pictures are relaxing for you, Norman. Enjoy your weekend! Thanks for sharing the yellow flowers. Somehow I always felt that wildflowers were a special treat compared to a cultured garden. With a planted plot, you knew what was was coming up and where. When wandering out and about and one comes upon a bloom of some sort or an interesting plant one’s never seen before, it seems kind of magical. Like a gift was left for you. Always a bonus for the day. Double points for capturing it in a photograph. As a child, I would always pick a bouquet during my meanderings. Now, I can have them forever at the touch of button with little interruption to their day. Hope some more blossoms are left in your path for you to find. Happy Friday to you, too, MV gal! You’re right. Wildflowers are a gift and always a pleasant discovery. I’ve photographed some others around here. It’s rare to see flowers so close in to the campsites like they are here. Usually foot traffic, tents, etc. remove any chance for them to survive right at the campsite. Sage is in bloom… soft, pale yellow flowers. Another bush with blade leaves and blooms that remind me of apple blossoms.. I’ll insert the photos in upcoming posts. Thank you. I wish flowers along your path, too. Now I see what you mean about that campground being well laid out and planned. It really looks like they took the best advantage of the terrain and vegetation’s natural placement . 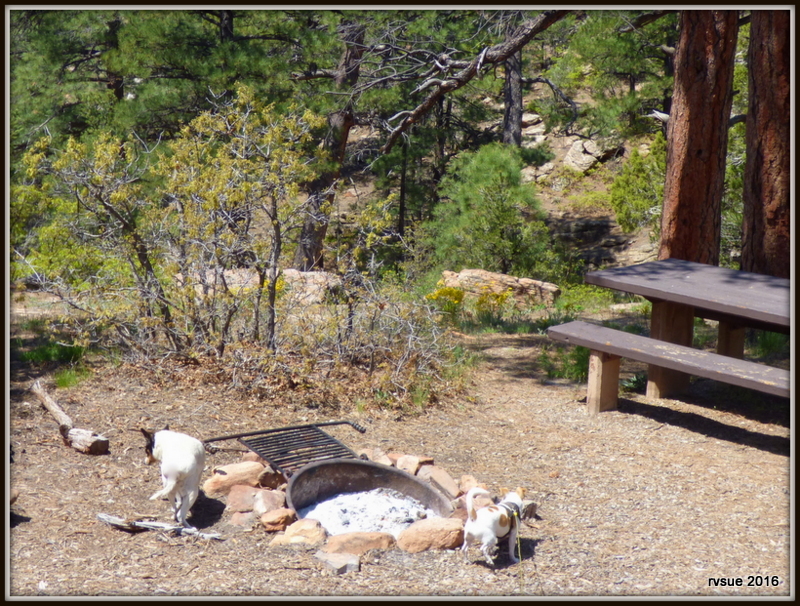 The campsites do seem private with a lot to enjoy and use while there. Your showing gorgeous places like that for $5/day and options, like the Silver Shadow, is a great way for folks to see affordable ways to get on the road that may have thought it was out of their reach, nice! If this blog does what you outline in your first paragraph, that’s plenty enough to make the effort worthwhile. I’m glad to know the photos portrayed what I wanted to show. Whoever designed this campground knew what she/he was doing! I love how you summarize my posts, making them clearer and more meaningful. Your last line touched me. Yep, still doing that, after all these years. By now it’s easy to follow your feelings, intent and where your thoughts are going. I have the advantage of slowly enjoying the finished work.While you’re making sure you use the right photos, dialogue, ads, links, story continuity to follow the previous post and precede the next-all while feeling the time pressure to get it done soon without too long between the pups’ needs. That’s among the benefits of our really “listening” to each other, that you demonstrate by understanding what I mean when I imply without my directly saying things, remaining aware of things I seldom mention, or recognizing it when I’m associating a topic to one we’ve discussed in the past. Lunch in my neck of the woods was pears with green apples for myself and bowls of food and cool water in and outside for all the critters. It looks like we’re in for a delightful to me and very welcome heat induced thunderstorm. Tucking into places to stay dry is always nicer with full bellies. You have a thunderstorm while we have rain and hail. What a world, eh? Fruit was enough because it was my third meal. First light is at five o clock here now. This world is certainly different than it was when we grew up. It’s more than the obviously odd phenomena in temperatures and precipitation, it has subtly changed beautiful lighting. In early summer one might see end time light of late autumn. Some Inuit describe it as “sun’s not right”, I just enjoy it. Oh, I feel better now with the third meal explanation. I had just consumed a lot more, when I read your comment. Ha! Interesting about the change in light. I would’ve thought the change was in us. I agree — whatever, “just enjoy it.” I hope you are enjoying the freshness brought on by yesterday’s thunderstorm. When I saw first saw hobbits’ food consumption I felt better. Ha! breakfast, second breakfast, elevenses, luncheon, afternoon tea then supper and dinner. Are the sites around you still unoccupied? It’s been nice and quiet around me so far. I hope it’s remained pleasant for you and the crew there. The site on one side is occupied and they’re quiet, gone most of the time. The other side is vacant. Loop A — reserved sites — is filling up today. It’s quiet over here in our loop. Looks like you’re enjoying a lovely day. I’m glad. Good Afternoon Sue, I wanted to take a minute and wish you a happy, safe and hopefully quiet holiday weekend. I plan on laying low all weekend and hopefully feeling like a new person come Tuesday morning. I am so looking foward to this weekend, I have been on the move and busy healing and helping healing for about a month now and frankly I am over it…so here’s to a great weekend for us ALL. I’m happy you are going to rest and relax this weekend. You’ve been on-the-go and now it’s time to back off. Looks like your weather will be warm and sunny. Enjoy! I love, love, love the picture of Reggie looking over the cliff, Sue! It is truly a great photo. This campground is so peaceful looking and inviting as well as being spaced well apart. When my nieces were young and wanted to pick wildflowers, I would tell them they were gifts from God to add beauty to the world and we had to leave them to grow for others to see their beauty. 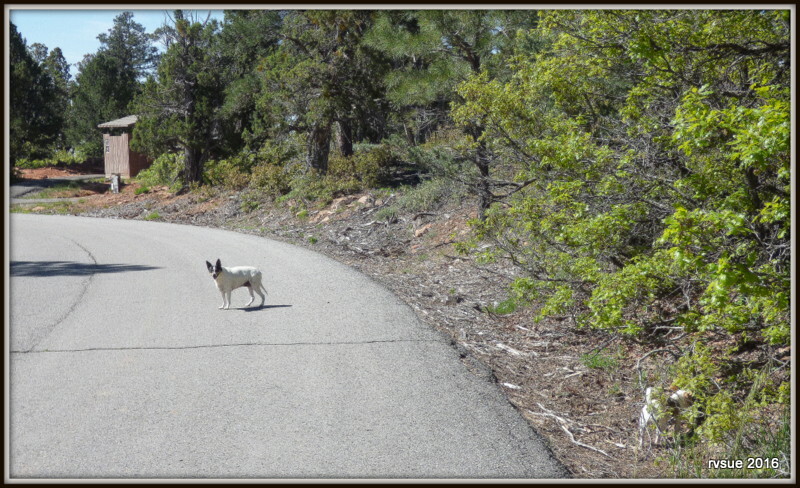 Of course, I also told them when we saw a rabbit by a stop sign that the spot was called “Bunny Corner”. It worked until they learned to read street signs! Enjoy your stay at this pretty place. Belly rubs for the pups and best wishes for you on your holiday weekend. Thank you for sharing. Love your comment…. The way you taught your nieces to leave the wildflowers “for others to see their beauty.” And “Bunny Corner”… cute. Hi Sue, looks like you’ll have a lovely weekend. A note about the Silver Shadow…it is made by the same company that makes the T@B that you mentioned a couple of posts ago. They are great trailers have several friends who have them. Fun sharing it with you, Lynn! I read all you posts Rvsue, though I don’t always comment. They sooth me and delight me here in my moving house limbo. May was supposed to be a travel month but fate intervened with a long awaited home move materializing at last. Your lovely photos and travel log help me relax from the stress and remind me I’ll be out there again soon. Thank you. You’re welcome, Elaine. My blog is relaxing a lot of folks lately! I’m glad of that. Thanks for writing. Nice looking campsites. Looks like the crew is having fun. I like your colander. How do you fit all your produce in the fridge? Isn’t it tiny? What powers it when you are camped? The solar? Propane? My fridge won’t hold a lot of fresh vegetables. I really cram them in there though. Sometimes I have to leave a few items out until I eat up some of what’s in the fridge. In cool weather that works. The fridge is about half the size of a standard size. The refrigerator is powered by propane. Power from the battery (solar charged) operates the electronic buttons on the front. We are having a great day. Thank you. It’s raining, I have a cup of hot tea, and the pitter-patter on the roof has mellowed the crew into napping. I hope your day is good, too. Such a lovely spot. Just my cup of tea, with trees and wildflowers and wonderful campsites. Nice weather, too. Almost 90 in the day and 79 at night right now, and mosquitos waiting at my front door to come in with me. That’s Houston for you. Even in Michigan, the mosquitos were bad, but not so much high humidity. It doesn’t bother me as much as it used to, but the mosquitos are irritating. I even have one of those electrified rackets that zap flying bugs, but these little devils never buzz by your ear – they just bite your ankles while you are totally unaware. So nice to see you and the pups having a nice time in thus pretty place. Mosquitoes in time for the holiday weekend! Wow, 90 degrees already. That’s Houston for ya.’ Thank you for the nice note. We’ve had three sunny days here. Oh my, I’m talking weather and the rain turns to hail! No kidding. It’s hailing! Ha! I hope that hail is not large enough to do damage. Yikes. Once had a vehicle damaged by hail on the top, but not the hood, while driving through Oklahoma in the Spring. Not fun. No, the hail was small and didn’t last long. You have a nice weekend, too. Hi Sue and gang. Those pups sure have the life and they sure seem to enjoy it. Smiles all around. The Silver Shadow is cute. I do like the kitchen layout better than the T@B. Well….I finally finished what I needed to to get this place on the market for sale and I signed the papers today. YAAAAAAAAAAAAAAAAAY! It is definitely time to simplify my life. Today I rest. Question about Bridgets ride. Do you have to lift her in and out of it? My lab is old and will be going with me (of course!) but she weighs 75 pounds and I can’t lift her. When we go in the car she handles the front paws and I boost the back end:) Any thoughts on that would be appreciated. By signing the papers today, I assume you mean with a realtor. Good luck with the sale! Yes, I lift Bridget into her car. It is meant for dogs up to 72 pounds. You asked for thoughts on what to do for your 75 pound lab. The first thing that comes to mind is a low-riding wagon that she can step into and you boost her back-end. If I find anything at Amazon that might work, I’ll add it here later. BLOGORINOS: Do you have any ideas for a big dog to have a “car” and how to put her in it? A wagon! There are plastic one and the ole red Ryder! Low enough for them to step into. Some have knobby wheels some have the regular tires…depends on the terrain you want to pull it in! 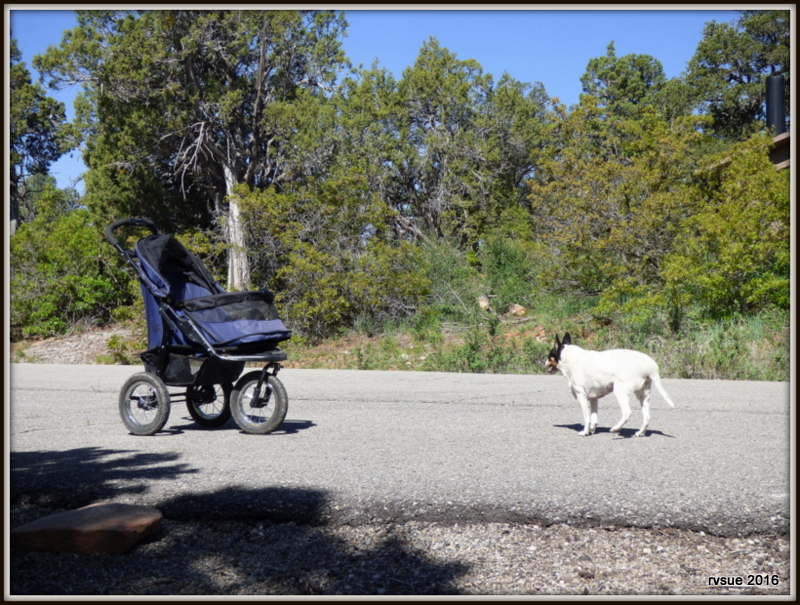 My golden Montana had one (Radio Flyer)he would walk until he got tired and then head for the wagon I would pull! You’re probably referring to the classic Radio Flyer. I see there’s one about 37 inches long which Linda can find easily from any of these links. We had that cargo Radio Flyer we pulled the grandkids around in. So much fun. Sides come off and on easily. It doesn’t have the big wheels with shocks like Bridget’s, but it probably would provide a smooth ride on paved surfaces. This one is probably better than the one I linked below which has seats in it. Ha Ha. That edit makes me seem even more of a goofball. (if that’s possible) I’m sure cats of any size would be comfy. 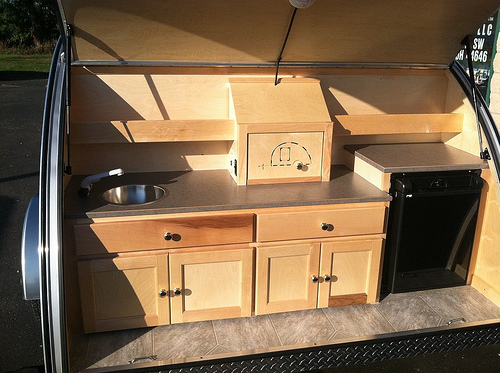 Take a look at this RadioFlyer… It’s foldable and has a canopy! I don’t know if it would work for a large dog. It shows two children riding in it. Gotta’ admit, it’s a cool ride. Bridget would approve! I see now that it has seats in it. I wonder if they could be removed. Not as easy entry though as a regular Radio Flyer wagon. Reading the questions for it… The seats do not lay flat and they are not removable. The other ones are better anyway. It’s a cute little buggy though… for children. Thank you both for your suggestions! I like the Pet Gear and the Mac Sport would work too. Good to know! Bridget has shocks! That made me smile-I must have missed that part. I appreciate your experienced help. Hopefully, I will be in the market for this RV stuff soon. Can hardly wait!! 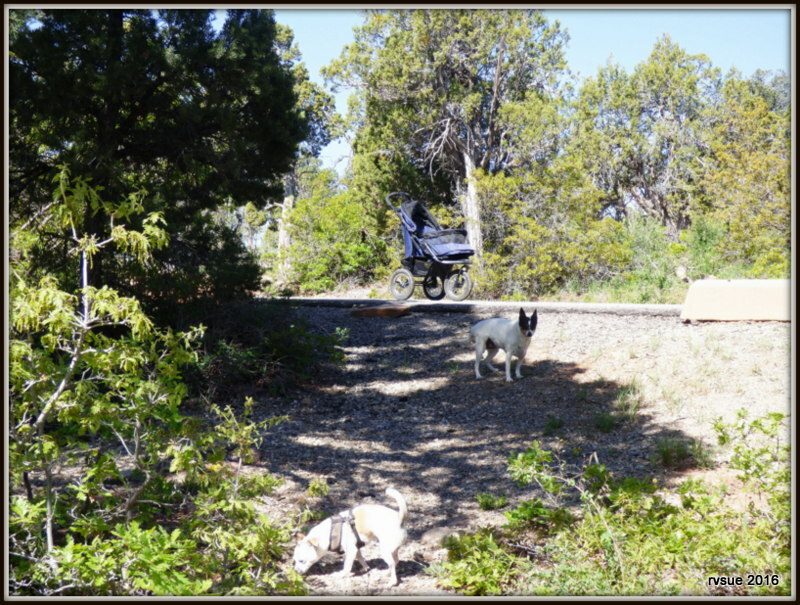 The pet trailers for bikes that convert to strollers are what you need for your big, old lab. 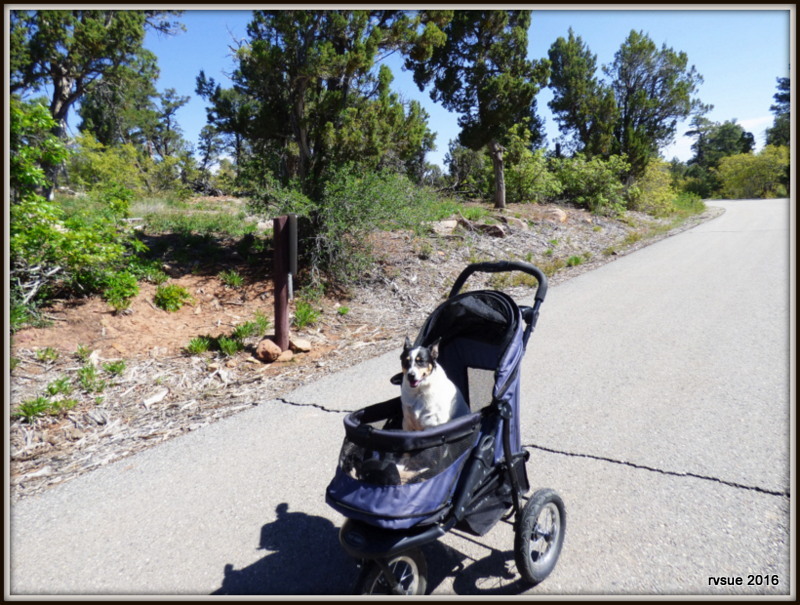 The reason that type will work for you is they are very much lower to the ground than a pet stroller and they also have a big rear entry that is very low down and will allow a dog to walk right into it. Just do a search on Amazon (using Sue’s link of course). 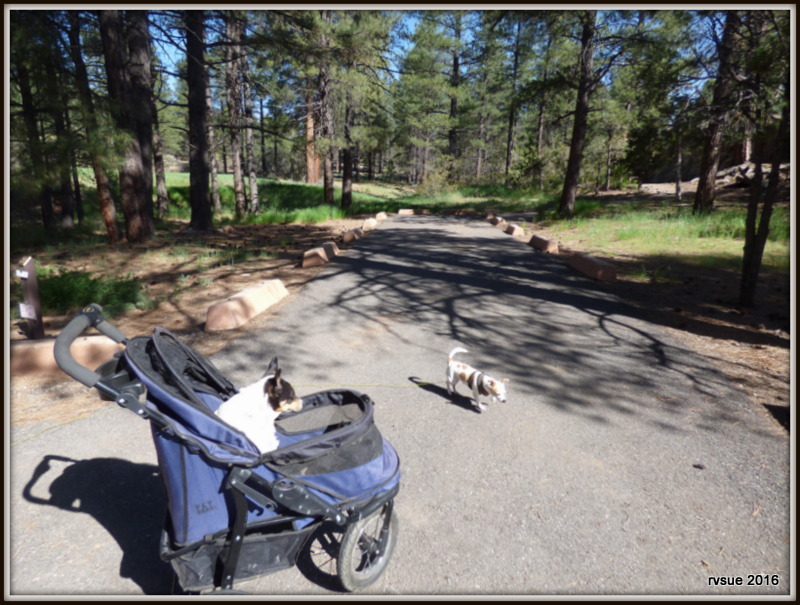 Keywords to use are “large pet trailer stroller”. Then look at the images for one with a big rear entry zippered door. They do have nice big wheels that are good for rougher terrain. Your suggestion may be just the thing for Linda’s dog, KC. I do feel I should add something that was told to me when I was considering a stroller like that for Bridget. I was told that the strollers that attach to bikes have a tendency to tip when used as a push-stroller. I’m not sure if they meant it tips forward or back, but these folks went ahead and bought an additional stroller, one like Bridget’s, for use without a bike. I also read something similar in one of the customer reviews on Amazon. That’s why I didn’t recommend the bike-trailer type. Thanks KC and Sue. I have options to consider. This sure is a good group! I will probably have more questions when I get going. I am just trying to plan ahead and get my ducks kind of in a row as if I sell soon, I will have a lot to do all at once. I love the photos today, Sue! I wonder if the campground is going to fill up over the weekend. I hope your site has a fair amount of privacy. Such a beautiful place for $5/night! I asked the camp host that same question. She said that she and her husband were here last Memorial Day weekend and it didn’t fill up completely. From walking around both loops it looks like the reserve spots fill up or come close to it. We don’t have any sites close to us. Looking at the photo with Bridget waiting for me to open the door, find that tree in the distance on the right side of the road. There’s a campsite behind it. You can see there’s quite a bit of space between it and us. Same thing on the other side. I doubt the $5 a night ($10 without a senior pass) will last long. Sand Island, Bluff, was boosted from $5 to $7.50. That would still be a good deal though for Devil’s Canyon Campground. Haven’t commented in a few days. I took on some additional work the start of May and these deadlines are that same as my regular work. Since both jobs require a lot of typing, I just get too tired to do much more that read your blog, which I do everyday. Still take my Angel out 4 times a day, though. She loves it now that the pool is open, as she usually sees kids going to or fro and of course they all have to see each other. We have a couple of families moving out this summer, so no more Duke, her German Shepherd attacker and no more Zinny, her other big dog attacker, that grabbed her up by the neck a couple of weeks ago. Unfortunately, the latter has kids she really likes. Our property was re-assessed this year and taxes have gone up considerably as a result. We have lived in this condo for 17 years and this was a huge jump. Of course that means the value has gone way up as well, by 60% to be exact from 5 years ago. This would be a great time to sell, but haven’t convinced DH yet, so I am trying to get our mortgage paid off in this next year, just in case something happens to either of us. If we lost one of the SS payments, the other could not afford to stay here. I have a plan, but his health does not leave him with much of a plan, due to no driving, slight mobility, reduced cognitive abilities, failing memory etc. He would have to have care, I’m afraid. Oh well, enough of the gloom. Looking forward to the holiday weekend, gas up the car, take a drive, get this house cleaned up and move on. Hope you have a truly great weekend, Sue and Crew. Love this camp and the beautiful scenery and of course seeing Reggie and Bridget. You work so hard and have a lot on your shoulders. Receiving a tax hike doesn’t help! From your comment it’s apparent that you are looking at your situation realistically and working toward finding and implementing a solution to what may lie ahead for you and your husband. My heart breaks for you as I “read between the lines” at what your life is like right now. Well, it’s good news that the attack dogs are out of the neighborhood! Maybe new friends for Angel will move in, dogs and people. I hope you have a chance to relax and enjoy the weekend. Like you say, take a drive . . . . Thank you for the sincere and sweet message for our weekend, Barbara. There is a lot between those lines. God bless you Barbara. I have been there and done that and I know how hard it is. All situations are of course different, but one thing that is so important and that I didn’t do because I didn’t have any help is take GREAT care of yourself. I did the best that I could with that, but with the stress and staying at the hospital, I soon got sick myself and am still dealing with it. Enjoy that weekend and relax. My thoughts are with you. DH is still home with me, as he can walk with difficulty & somewhat care for himself, such as bath room and showers, no cooking, but without me he will have to go to some kind of facility. Thankfully we have good neighbors that would help for awhile, but you know how that goes. I do cook healthy meals, take an exercise class 3 days per week, work (too much) walk my dog, socialize with my neighbors while walking Angel, as she has to see everybody. Hang in there Barbara. It sounds like you are trying to take care of you also. Hugs to you and your family. 3/4 C brown sugar & 3/4 C butter; then let it cool. in cr cheese mixture. Yum, yum, yum!!! Rich, rich, rich! All the gizmos are now ready; G loading up boat & fishing stuff. Heading out Tues north to Blue Lake (south of Grand Coulee Dam). Plan to stay out at least 2 weeks & wander around a bit. Love it here but the road beckons—- could be because I read RV Sue daily!? That’s quite a tempting dessert! Wow…. and with fresh strawberries. I looked up Blue Lake… very pretty! Have a wonderful time…. and thanks for the update. Looks technical…..also looks like it’s on the kitchen counter! ? From here it looks like granite bull nose edges with a backsplash…keruig carousel…yep that’s the workbench alright! Mick…what’s the Harley doing in the livingroom? ? Oh my gosh Mick, you have made a lot of progress since the last pics you posted. She’s looking great! How wonderful to have the talent to do a project like this. When it’s done you will know every inch of how it’s built. What a sense of satisfaction and accomplishment that will give. Do you have a target completion date? Look forward to the next update. Looking good Mick. You do neat work. The trailer is looking good, Mick! You are very talented! I love this new campsite! The yellow flowers and the trees are beautiful. Funny thing, this morning I ran into a BiteMe stuffy at the store. Thank you for sharing the pictures and links of the different RVs on the past few posts. It is always interesting to see other options that are available. I still love how your Casita has the large, wrap around windows, allowing you to stargaze while in bed. A rig that has maximum windows almost making you one with your surroundings is a huge plus for me. It makes me very happy to see Bridget enjoying life, and leading you all home on walks. These days are so precious. Does Bridget eat the pine cones or just peel them apart? Her version of a Rubix cube! It is so hard to believe that Reggie has been part of the Crew for over a year now. He has really grown up during this time. It seems that he has lost many of his fears and insecurities and has really taken to life on the road and being the protector of his family. Such a good boy! I will be having hand surgery early Tuesday morning. I am getting nervous – not looking forward to it, but at least it is something that can be fixed. If I am not commenting for a couple of weeks, please do not think that I fell off the face of the earth! One of the compelling features of the Liberty Deluxe model of Casita is the wrap-around windows, three big ones. I like it when the BLT is positioned so that the back window opens up my house to a spectacular view I can enjoy while writing or reading online. Yes, the Reggie Man has grown in confidence. 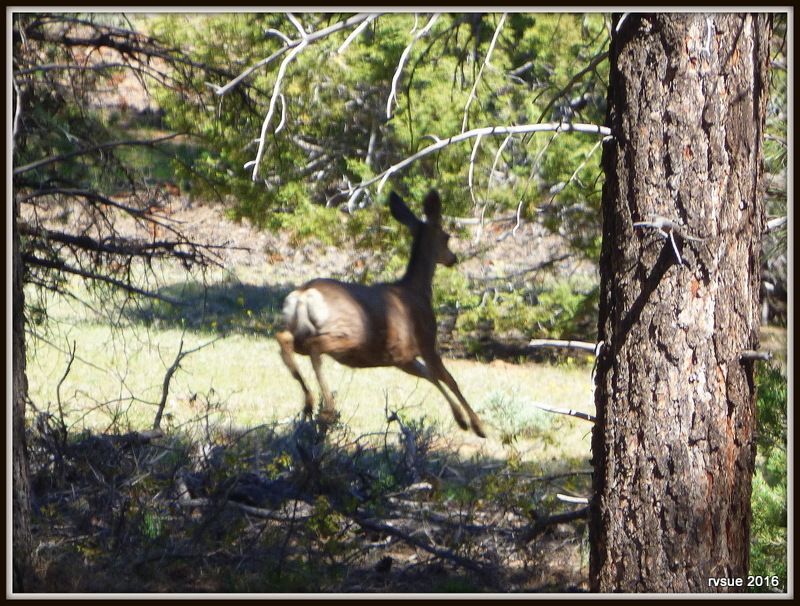 It’s funny how his gait changes once he “knows” a campground. He flings his front legs out in a trot that’s part strut and holds his head high. 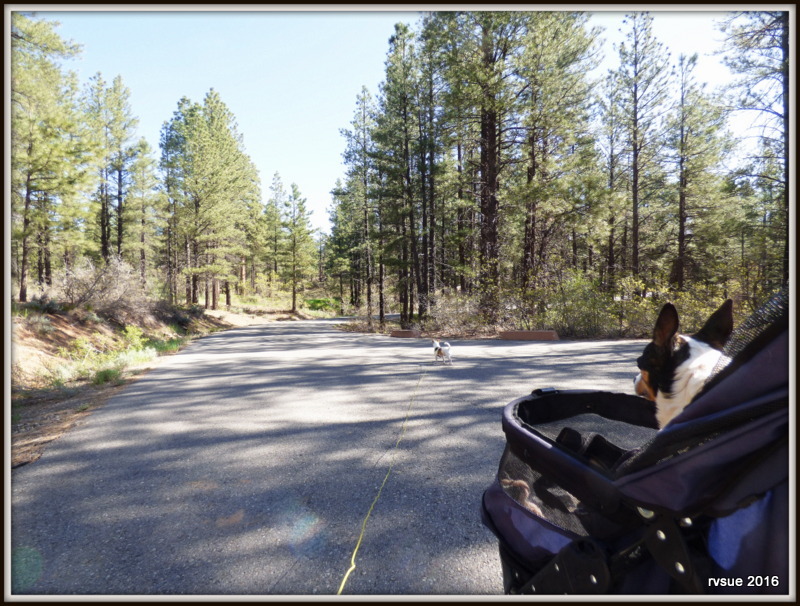 Between Reggie’s flashy body and crazy antics and Bridget’s regal appearance in her car, we attract attention as we go around the campground. Children squeal over Reggie. A couple stopped their car and asked if they could photograph Bridge in her car. Hand surgery on Tuesday. I’m glad that your hand will be fixed. You’ll do just great! Thanks for letting us know why you may not appear in comments. Try to enjoy your weekend. Hugs to you and the Gracie pup! I hope your surgery goes smoothly and you hand heals quickly and properly. Will you have much physical therapy afterwards? Did your wrist get damaged or was something growing inside? Is it your dominant hand? How long did they say it would take to be back to full strength? What a nice camp grounds! Love the pictures of the crew…especially seeing Bridget looking so good and leading the way back home. Heat is starting to rise in Mississippi…has been pleasant but the 90° temps will be here by the end of next week. Most of the bad storms have gone to the north of us, thank the Lord, but some around us have had a terrible time with flooding . Hope you have a quiet and peaceful Memorial Day. School’s out! (except for the professional development meetings over the summer) I may be able to chime in every now and then! Stumbled across your site a couple of months ago. Thought I’d drop you a note to say **thank you** for the photos. I’ve camped in many of same the sites in the past (too distant it seems) and it’s nice to see how things look today. Thanks again for the pics and best wishes to you for your journey! Welcome to my blog! I’m glad you found us. Maybe I’ll post more photos of camps from your past. I wish I had skills and could build my own teardrop. I would create a design where the bed was not on the floor, and you could have a desk area with a seat. Maybe about 5 feet tall inside. The ‘desk’ area would be the width of the trailer. With cubbies underneath for a porta-potty and some sort of fridge or cooler. And a knee-hole for sitting. The other side would be the bed with storage underneath. Since I have to plug in every night for my c-pap, I would carry a toaster oven too. That’s about all I need. Fantastic fan in roof. Small electric space heater in winter. The back of the trailer would mainly be storage I think. But alas, I don’t have the skills. You have other skills, other gifts, just as valuable. I know what you mean though. It would be nice to have that skill. You obviously have the conceptual skills, DeGin, and that is the high level skill necessary for a successful project. The problem with any “one off” endeavor is the labor cost. You could do the design and contract out the build but bring your very fat wallet. If Tim had to pay for labor the Moby1 @ 30K$ would be a bargain. Yes Mick, I know labor is the issue which is why I lament my lack of skills. People who make things are always underpaid. My mother was a talented seamstress who would spend many hours on her creations, but people wanted to pay less than ‘store bought’. My mother was also a gifted seamstress, and in her later years turned it to award-winning quilts that were featured in magazines and art calendars. But she hated mundane chores. Women in the neighborhood said she’d rather make me a new dress than iron the old one, and it was so true, that she bartered her talent. A friend would buy fabric and pattern [with my mother’s guidance, to make sure it was an appropriate fabric] and bring it to our house. Then they’d chat while my mother made the dress and the friend did all the ironing! Ginger, my van has two house batteries and handles my Cpap just fine. We have a single solar panel up top to recharge. Best way to do Cpap on road is to get the 12 volt adaptor cord for it and plug into 12/cigarette lighter type outlet as it uses batteries more efficiently than a inverter. I’ve been faithfully reading your blog, and as I said in a previous post I’m kinda shy to comment in your comment section. Please know that this in no way is a negative about you, your blog, your awe-inspiring pictures and the wonderful pups you have! I also told you I was reading your blog from the beginning and now with the notices in my email I keep up with your most recent posts. 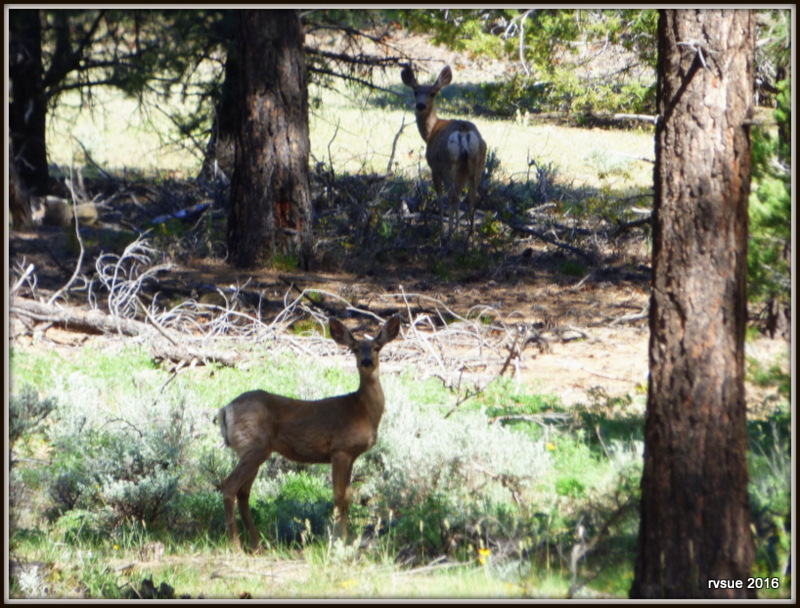 Right now, I’m in July 2013, you’re camped just west of Montana at Tinney Flat Campground. You’ve been boondocking most of the time, which I find fantastic, because I want to boondock as much as I can once I get out on the road on my vagabond journey. There are times you think you are writing about something as mundane as hitching the BLT to the PTV but I learn from that, and I like learning, so to me it’s not mundane. I’m sure there are others out there reading your blog who are learning just like I am from your “mundane” adventures! I appreciate that you put that information in your blog, so thank you! I have found several sites/blogs about full time RVer’s, but your blog is by far the best! You’re interesting, your pictures are beautiful, even all the pictures of Spike laying in the mud ( God bless his soul, Spike is probably on God’s lap right now!). I hope doggie heaven has lots of streams with mud just for Spike and all the other doggie friends he’s made! I’m sorry if bringing up Spike has hurt you in any way, if so please accept my apology. He was so very special…. I’m so interested in your Solar set up. Is 200 watts enough for you to spend as much time on the laptop as you would like? Or does the battery drain down too fast? Is your laptop plugged into a 12 volt connection? What device, or appliance, or what not eats up all your battery power? I know some of this has been answered in the comments sections and on your drop down menu, but if I read all the comments all the time I’m afraid I’ll never finish reading your blog! I do read a lot of the comments, there are days that I don’t read them all, though. I BOUGHT MY TRAILER!! Well, I sign the papers next week and then they are going to store it for me in their fenced in, secure lot until September, or when the house sells, whichever comes first! They’re not going to charge me for storage either, isn’t that great! I also bought what I hope is going to be my PTV this week, too! It’s a 2002 Tahoe, with the trailer package, has less than 100,000 miles on it and it was owned by the owner of the shop where I take my car and my mother’s car to get fixed. They’ve always been very honest in their dealings, for example, they will let you know something needs to be fixed in 6 months but right now it’s fine, stuff like that. I’ve been taking our cars there for 9 years. The Tahoe is loaded, it looks brand new, it even has heated seats, but I doubt I will ever use that feature…my body is on the hot cycle all the time and has been for double digit years, the doctor says that will eventually stop, but geez, it’s been a long time! I take care of my mother and she is always cold, so it’s a little bit of a battle when the house AC has to be on, LOL!! Oh no, I’m writing a book on your comment section!! See, I’m embarrassing myself already! I looked at a Casita just like yours, but I felt a little claustrophobic. It may also end up being my permanent home forever, so I thought if I ever needed to just park it, it would be a little more room, especially on those rainy days when you get stuck inside. I bought a Nash22h, which is just shy of 25 feet and that includes the hitch. It’s a 4 season, off road capable, trailer. It’s supposed to be a good one, I hope it is. I’m ready to get on the road, but I need to be responsible and see that mom gets into a good retirement community, the house gets sold, all that stuff, etc. Thank you again for being such a wonderful blog writer, one that is entertaining, educational without even knowing it sometimes, full of great pictures, and most of all I appreciate your honesty. There have been a few times that some blogorinos got snarky with you, and you were right to stand your ground, because they did not READ what you wrote. That’s one of the things teachers, you were one, I was one, we were always on the kids about really reading, taking in the info and digesting it correctly the first time. You go girl!! You do a superb job, and I love your pups (Brigdet, Reggie, and Spike too, *sniff*), they are sooo CUTE! Now remember, I’m here reading all your posts even though I don’t comment every single time. Thank you for your encouragement to all of us that are in the stages of becoming a vagabond like you. 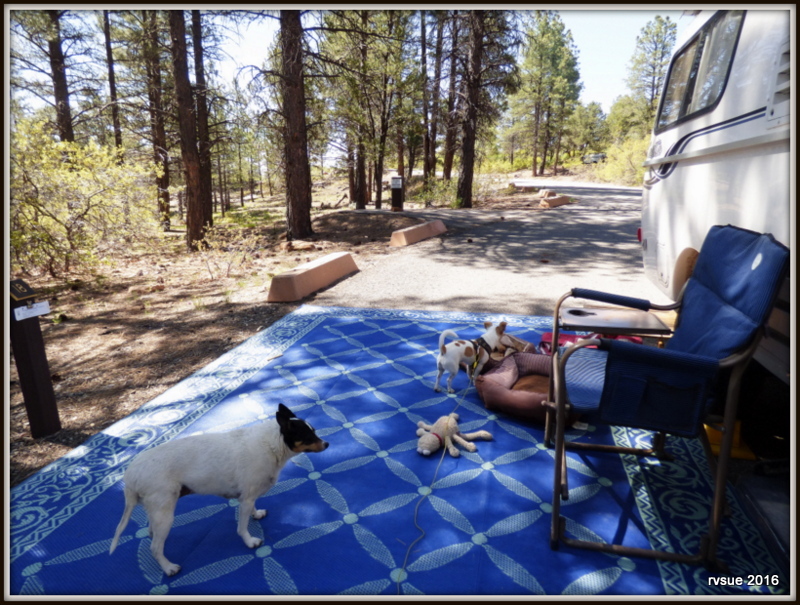 Thank you for writing with wit, information, (even the pictures of your campsite or other campsites are educational/informative), and love of animals and nature, as well the love you show your blogorinos! Once again, forgive my “book” of a post! Forgive my incorrect grammar, etc. Hi, Beth! Thank you for this wonderful comment! I’m almost ready to put up a new post, so I won’t reply right now with answers to your questions. Once the new post is up and a few comments have come in (the race to be first! ), I’ll move your comment under those and answer there. It’s such a great comment, I want others to see it and it might be missed sitting here at the end. Okay? Talk to you later… I’m so excited for you!!! Sounds fine! Enjoy your evening! I loved reading your comment, Beth! I went and looked up the Nash22h and you’ve picked out a really nice rig. Not too big, but as you said, roomy. You have a lot of things on your list before you can take off, but it’s exciting being so close! It is exciting, but yep, lots to do. Thank you for liking my comment. I’m super excited to hit the road, but what’s the saying… Good things come to those that wait.? Maybe I just made that up, I’m good at messing up quotes, ?. 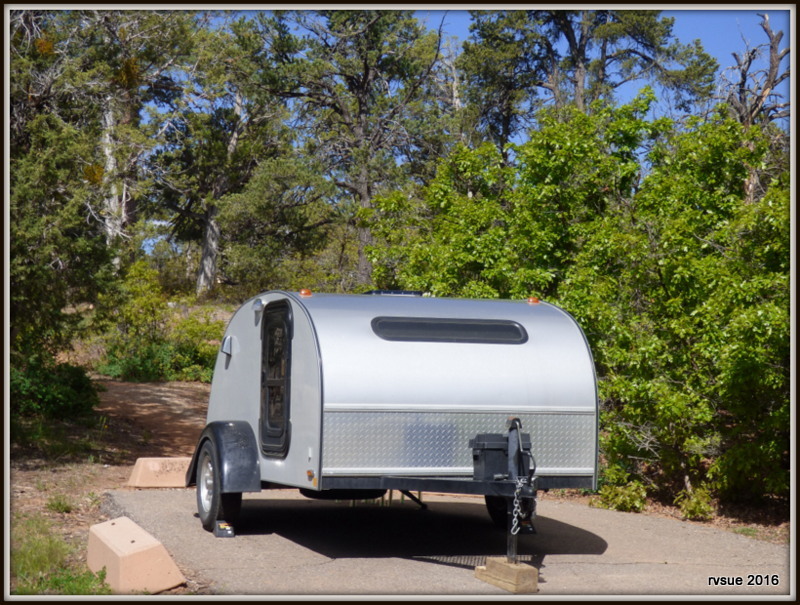 Yeah, the Nash is a little roomier, but supposed to be very sturdy and made for boondocking!